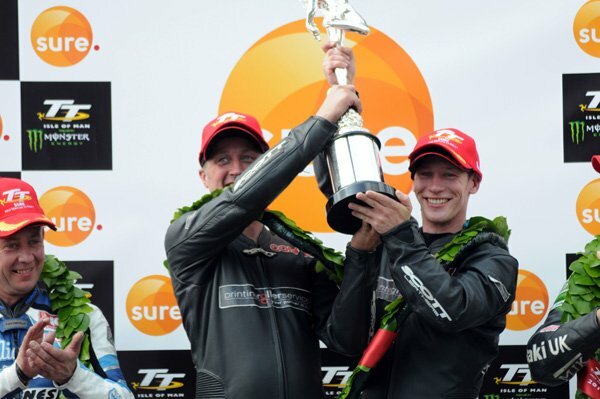 After six previous podium positions and over 20 years since his debut, Conrad Harrison, partnered by Mike Aylott, took his maiden Isle of Man TT victory on Saturday after coming through from an opening lap fourth to win a dramatic opening Sure Sidecar race. Harrison and Aylott took the win by 17s from former winner John Holden/Andy Winkle with last year’s Race 1 winner Tim Reeves, now partnered by Gregory Cluze, a further 16 seconds back in third. With conditions remaining ideal all round the course, Ben and Tom Birchall grabbed the early initiative at Glen Helen on the opening lap but it was tight with their lead over Holden/Winkle just 0.7s as Dave Molyneux/Patrick Farrance found themselves four seconds further back in third. They, in turn, were only two tenths of a second clear of Harrison/Aylott with Tim Reeves/Gregory Cluze less than a second behind in fifth. By the end of the lap, the Birchalls had extended their lead to four seconds after a lap of 114.335mph and Molyneux/Farrance moved up to second with Holden/Winkle dropping to third. Harrison/Aylott and Reeves/Cluze still occupied fourth and fifth but the local pairing of Karl Bennett/Lee Cain moved up to sixth place. As the outfits swept through Glen Helen second time around, Molyneux/Farrance were now in the lead by ten seconds with Holden/Winkle in second and Harrison/Aylott third as news came through that the Birchalls had crashed out at the Black Dub, fortunately sustaining only minor injuries but the brothers were taken by airmed to Nobles hospital for further assessment. Having started at number one, Molyneux/Farrance were taking full advantage of the clear road and with the fastest lap of the race, 115.538mph, on the second lap, they rocketed into a 21.5s lead. The battle for second was hotting up though as less than a second separated Holden and Harrison, Reeves still in fourth ahead of Bennett/Cain and Ian and Carl Bell who were having a great drive in fifth. However, more drama lay ahead as Molyneux/Farrance failed to make Glen Helen on the third and final lap, later being given as a retirement at the Hawthorn, and that meant Harrison and Holden were now fighting it out for the race win with still only 0.9s between them. 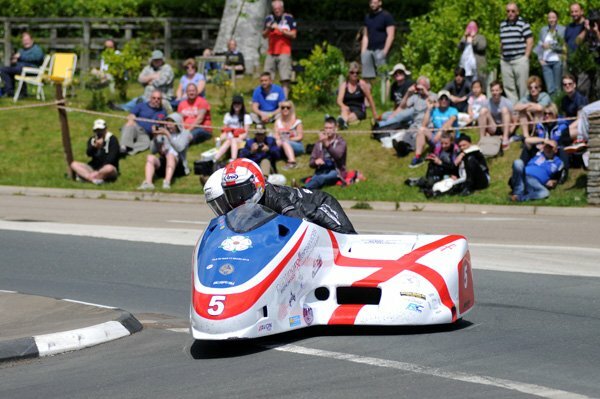 However, as the lap wore on, it was clear Harrison/Aylott were stronger and they soon opened up a sizeable gap over Holden/Winkle and, aided by their fastest ever lap of the TT Course at 114.674mph, they took the win by 17s with Reeves/Cluze a similar margin behind in third. The Bells took a brilliant fourth on Ian’s return and Carl’s debut, posting a brilliant final lap of 111.242mph, and Bennett/Cain upheld local honour with an excellent fifth place. Wayne Lockey/Mark Sayers secured their best ever position in sixth with former race winner, as a passenger, Darren Hope in seventh, partnered by Paul Bumfrey. Greg Lambert/Kenny Cole, Roy Hanks/Kevin Perry and Gordon Shand/Phil Hyde completed the top ten whilst an excellent drive by newcomers Alan Founds/Tom Peters saw them come home in 11th and after a brilliant final lap of 108.506mph.